This my very first OOTD so I hope I do this right. I kind of made a vow to not buy makeup for the mean time because I really need more clothes. I've been spending too much money on makeup and skin care that I forgot to replenish my closet. So for now, I'd be buying more clothes and shoes and bags and maybe makeup after 2 months. I need a makeup diet. For this first OOTD, I wore a Korean top I bought from a Korean clothing store at Rob Place Manila. You can find it at Sleek Ave it is, I think. It was 50th Ave when I was still a frequent there. The skirt is also bought from a shop at Sleek Ave. For my flip flops, I bought it at Penshoppe. I do love their flip flops because aside from their cute designs, they're pretty affordable too. The bag is from Cose and was given by an office mate last Christmas and then there's the sun glasses which gives the whole look this very sassy chic effect. Oh, as you can see, I'm quite addicted now to Easy-Phamax Wheatgrass ever since it has been introduced to me last Blogapalooza. Yum,yum and nutritious! Oh and can you see the tassel hooked earring I'm wearing? Bought it from MissGennD! She'd be one helluva great designer soon! She'd also be making my tutu skirt on our company's 80's themed anniversary party. Expect more OOTD from me and, well, still makeup reviews cos I still got too much makeup unused and unreviewed, so fret not. We're just gonna have a balance of things in this blog. So, till next post guys. Thanks for all the encouragement and support with my blogging! love your makeup! :) I love the graphic tee-shorts combo! I agree, loving genn's craft... galing! love your first ever OOTD! Congrats! Masarap ba talaga yung wheatgrass? Everyone's talking about it eh. ;p Love your first OOTD! Keep 'em coming! Oh yes..umo-ootd na! Congrats and more to come! See you soon! :) mwah! 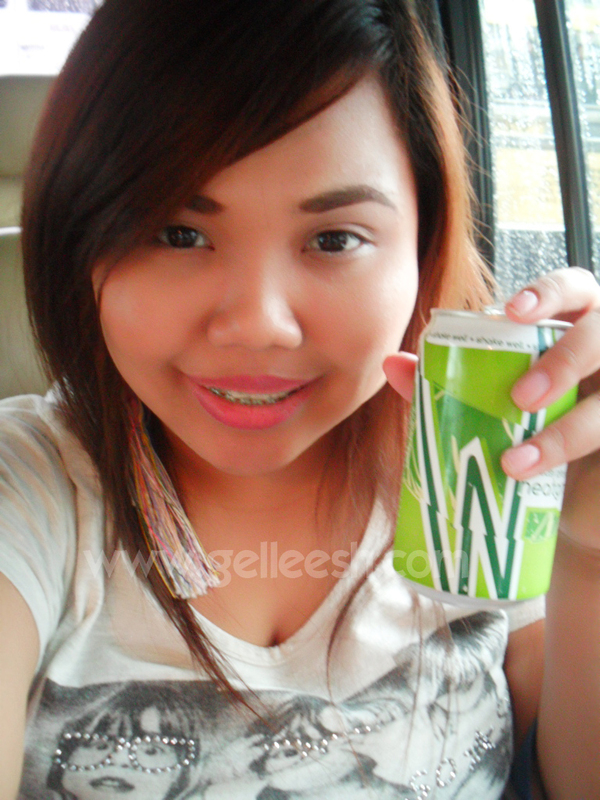 ps: d ko pa na try wheatgrass hehe..
i have been so addicted to wheat grass, bought my own stocks na after trying it from the loot bag :) love your shirt!